Recently, Stack’s Bowers Galleries, in conjunction with Sotheby’s, announced the upcoming sale of the D. Brent Pogue Collection of U.S. Coins. It is one of the most extensive collections ever assembled and thus one of the most valuable. This amazing sale will include two Class I 1804 Bust Dollars, one of which happens to be the finest known in PCGS PR68. Also featured will be the only 1822 $5 Gold held in private hands; it is graded AU50 by PCGS. There are a total of three known coins but two of them are in the Smithsonian so this is literally the only coin to be marketed since the 1982 Bowers and Ruddy Sale. This date is without a doubt one of the top ten U.S. rarities of all time and the present piece should command some terrific bidding activity. Since the 1822 $5 Gold is ultimately unique to own, its sale will put a spotlight on this fascinating series as a whole. The Capped Bust series runs from 1807 through 1834. The coins minted from 1813 to 1829 have a larger diameter than the successor series, although both types overlapped in 1829. The total mintage of the 1813 to 1829 short series, as listed in the Redbook, was 717,409, of which 263,806 were minted in 1820, nearly 37% of the entire mintage. Adding the 95,428 coins from 1813, 50% of the total mintage was from these two years alone. That makes the rest of the coins in this short series very rare. Totaling the number of coins certified in this series, there are 454 coins in circulated grades from Good to AU58, with 158 of them being certified AU58 by PCGS and NGC. Granted, there may be additional coins that are not certified in the lower circulated grades that skew this total, including problem or details grade certified coins. As for Mint State coins certified, there are 707 total for all dates. This includes the 354 coins for the 1813, which is a little over half of the Mint State coins certified for this short series. The highest grade certified for any date is MS66 for 7 different dates: 1813, 1818, 1820, 1821, 1826, 1827, and 1829. The lowest FMV in MS66 is the 1820 at $190,450 and the highest is the 1829 at $780,000. However, the 1829 has not traded in quite some time and this value could easily approach the million dollar mark. The NumisMedia FMV Price Guide lists 19 different dates and varieties in this Capped Head to Left series. The nine coins listed below do not include the eight rarest dates because they are so difficult to acquire with only a total of 47 coins available in all grades, and the two most common dates, 1813 and 1820, even though they are still quite rare. The remaining dates are compared by the number of coins available in Mint State, the highest grade certified, the population for the highest grade, and the current FMV along with the FMV from five years ago. There are numerous aspects of this chart that point out how rare these dates are in Mint State. The fact that we do not list prices for two of the dates in the highest grade indicates that we have not seen these two coins trade. Further, there are several dates that have not changed FMV in the last five years for the same reason. The one exception here is the 1824 which traded at a discount early last year and most dealers felt that it should not influence the FMV. Looking at the increase for the two coins that actually traded in the last five years, the 1823 and 1826, one could speculate that the other coins that have not seen the FMV rise over this period would also increase dramatically if made available. While the 1814/3 has 12 coins available in its highest grade of MS64, the remaining eight dates have a combined total of 14 coins in their highest grades. Thus, there are only 14 Registry collectors in the entire world that can own any of these highest graded rarities and we know there are hundreds or even thousands of collectors who are interested in this series. Taking this one step further, there are only 246 coins certified in all Mint State grades for these nine coins. That is such a small population that it would not be difficult to expect this series to make a strong move over the next several years. One added note here is that there are only five dates in this short series that trade in various grades on a regular basis; they are the 1813, 1814/3, 1818, 1820, and 1823. The rest of the dates are found very infrequently and usually cause quite a stir when they appear in a major auction. 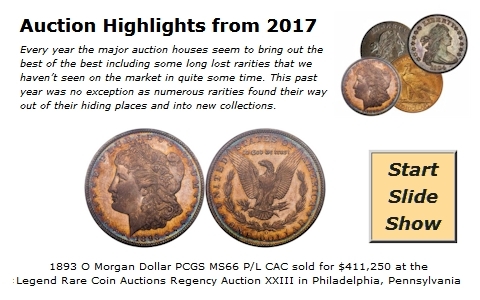 Many dealers feel that the upcoming sale of the 1822 $5 Gold will provide this series with a resurgence that will inspire new collectors to compete with all those already captivated with these true rarities.